Timing - a Shorewatch takes 10 minutes to carry out and should be done no more than once per hour (this gives any animals present a good chance to have left the area before you start the next watch). Watches should not be carried out because dolphins are known to be in the area. This would bias the data towards dolphin presence; therefore watches should be pre-planned. Finally, make sure you have time to watch for the whole 10 minutes and be prepared; allow a few minutes before to get set-up. Weather – only carry out a Shorewatch if you are confident that the weather conditions would not prevent you from seeing animals should they be there. We want to keep effort consistent. If it’s raining so that you can’t see through your binoculars, your effort won’t be the same as on clear days. Equally, if the wind is moving you around, it will be hard to keep your binocular scans even. Training – every Shorewatch volunteer attends a training day to ensure constancy between individual observers; if you would like to carry out watches for the Shorewatch programme please contact the Scottish Conservation Officer on shorewatch@whales.org or see the volunteers page for more information about volunteering. 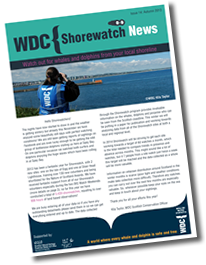 Equipment– all volunteers use specialised WDC Shorewatch equipment to ensure consistency. The WDC Shorewatch equipment is kept at the site and shared between volunteers. Before starting your Shorewatch an assessment must be made to determine whether or not a watch should be carried out. 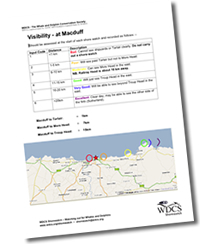 This assessment should take into account Seastate and visibility as this will affect the probability of a sighting. Separate your survey area into roughly 4 equal parts. Using your binoculars scan each quadrant for 1 minute, starting with the left side of the survey area. To scan each of the 4 sections will take you 4 minutes. Set your interval timer to beep every minute to help you time this process. Note: If you complete scanning a quadrant before the timer sounds, repeat your scan of this area until you hear the beep and only then should you move onto the next quadrant. If the timer sounds before you have finished a quadrant, move onto the next quadrant immediately to maintain an even effort throughout the area and try to adjust your pace for the next scan. Using only your eyes, scan the entire watch area for approximately one minute. Try to keep your eyes moving, looking slowly from left to right and taking in the sea from the horizon into the shore. Although you will see less well at a distance than when using the binoculars, these scans take advantage of our peripheral vision and allow our eyes to rest in between binocular scans. If you spot any hints (link to cetacean sightings page) that cetaceans are present in the area use your binoculars to investigate further. Overall, a Shorewatch should start with a pre-watch scan and then follow the pattern: 4-min binocular scan, 1-min eye scan, 4-min binocular scan, 1-min eye scan. Try not to be distracted by anything during the 10-mintues. It is important to concentrate fully to maintain even effort and maximise the chance of seeing any animals in the area. If a member of the public starts speaking to you during a Shorewatch, explain that you need to keep your eyes on the sea for 10 minutes and invite him/her to help you watch.